“Jimi’s true home was in the studio. 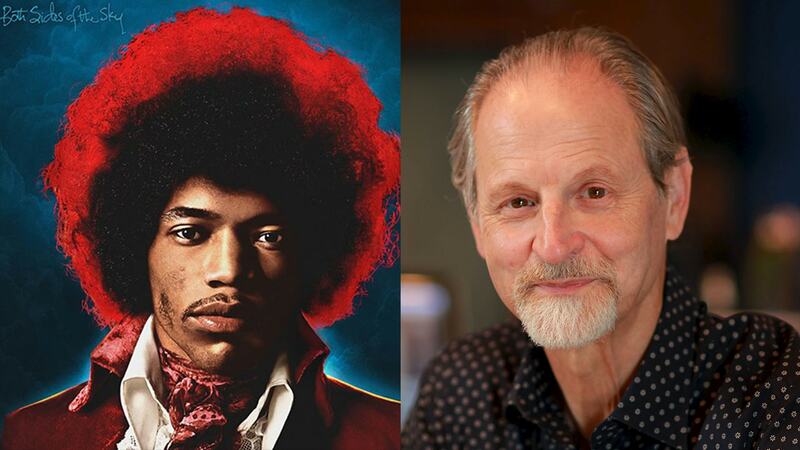 It was where all the music and magic happened”, says Eddie Kramer, who helmed Hendrix’s original 60s classics and oversaw many of the legend’s posthumous releases, including the latest, Both Sides of the Sky. Released March 9, 2018, Both Sides of the Sky appears to be the final volume of unissued studio recordings remaining in the Hendrix archives. We got the chance to talk to Eddie about pushing the sonic boundaries of music while working with Jimi, and what was involved in the audio restoration of this stunning collection of studio recordings. Eddie, what was it like to reopen these original studio recordings? It was an incredible experience – no pun intended! We’d been working on this project for a long time – almost a year. This is the third album in a series, after Valleys of Neptune and People, Hell and Angels. During the time we were working on those two records, we kept coming across material that we thought, "might be cool for a studio album down the road." So, in this record Jimi is playing live in the studio during a period when he was experimenting, rehearsing and recording. Once I transferred all the tapes into the digital realm, I listened back to it and it was just stunning to hear the performances and how immediate they sounded. This is stuff that was done 40-plus years ago, and it's just amazing to hear Jimi's voice coming over the speakers, or hear my voice coming from the talkback. It was kind of scary. You served as the chief engineer on every album Jimi made during his life. There was a musical transition happening during this period in his work – a funkier, more soulful sound. How did it get there? There are elements of this funkiness contained within Electric Ladyland. You can hear it on songs like “House Burning Down” or “Still Raining, Still Dreaming” – and that’s still 1968. It's very clear that was the direction Jimi was headed in – the sort of funky, R&B, blues, pop kind of thing. When you get to 1969, which is the year most of these recordings [on Both Sides of the Sky] were done, this was a period of adjustment and heavy experimentation for Jimi. He basically lived in the studio and learned to use it as an instrument. But that got very expensive. In fact, the reason we built Electric Lady Studios was when I said, “You guys are crazy! Why don't we just build the best studio in the world for Jimi, because you know he’s spending about $300,000 a year – that’s 1969 dollars! – for studio time as the tape is constantly running.” And thank God we did it, because it yielded a wonderful cache of material. How did you approach the digital restoration of the outtakes on Both Sides of the Sky? My techniques and way of working have evolved from the desire to make Mr. Hendrix sound bigger and better, with a lot of attention paid to the detail of the restoration process. So, my philosophy is to get the very best out of both the analog and the digital worlds. I’m working fifty percent in the box, and fifty percent with my outboard gear and the console. These performances are live in the studio. So you can imagine all the vocal takes that have a bunch of drums and a bloody 100-watt Marshall guitar amp behind them! And the separation ain't that good either. I had to really act like I was on an archaeological dig with a little brush pushing away all the dirt before I reveal the little gem. The use of plugins made my life quite a lot easier because I could pinpoint certain things and do stuff in the box which I couldn't do before. I can really fine-tune things and be like a surgeon – pick apart a vocal track and find all the nuances. I first transferred the original 4, 8, and 16-track tape formats into Pro Tools via Burl AD/DA converters, so I now had a source that was as good as the original tape. Then I mixed it on a vintage API console with flying faders and automated some of my moves in the box. I have my sort of set bank of EQs and compressors that I love to use. I quite often use my own Kramer HLS Channel because you know it's based on the Helios EQ that I originally recorded all of Jimi’s stuff with at Olympic Studios in London. There’s a particular frequency that I use quite a lot – it’s so useful. It’s that 2.8 kHz boost that is just glorious for guitar, just punches through this particular area of Jimi’s sound (and most guitar players’ sound). I also used the PIE Compressor plugin – can't live without that. I’d used the original hardware at Olympic too – we had very little else an Olympic in the early days for the first few albums. So that PIE Compressor was on everything: vocals, guitar, piano. Same with the plugin now – and it's particularly aggressive on drums and piano. I mean you can really make that thing pump. One thing I got to tell you about in terms of the mixing on Both Sides of the Sky – virtually every track has the Abbey Road Reverb Plates, but with a nice little twist: if you use the Kramer Master Tape plugin ahead of the Abbey Road Reverb Plates plugin, and you set it up as a pre-delay, it sounds absolutely stunning. We've used that a lot on this album – on every mix for every song, whether it’s Jimi’s vocal or Jimi’s guitar or both. It's really effective. And I use it a lot in my contemporary mixes that I work on now in my studio. This version of “Hear My Train A Comin’” has so much fire. On Both Sides of the Sky, instead of the Band of Gypsys, we’re hearing the original Jimi Hendrix Experience with Noel Redding and Mitch Mitchell. What was that experience like? Yeah! It's one of the great tracks on this album. It takes the delta blues and pushes us far beyond any of the parameters that the founding bluesmen had figured out. Takes the blues to another planet. On “Mannish Boy” Jimi once again pushes the boundaries the delta blues beyond outer space. The use of the Univibe, his call and response with the vocals and guitar – it’s incredible. How did you manage to polish the vocal tracks for this session? That version – amazing, isn’t it? Working on the Both Sides of the Sky version, it was really a question of how do you look at the vocal track in the waveform. And you figure out, “Okay, well here's where the guitar itself is breaking through onto his vocal mic.” And I do a lot of internal rides, several kinds of EQ, filters, compression. And anything that's really nasty, I'll try to filter it out so that it does not interfere with the quality of the voice. And I think that the results are pretty good. For a live vocal, I think it sounds pretty present. But you know, I can still imagine Jimi standing in the bloody studio and playing that song. He’s singing in falsetto, in unison with his guitar. And not only is he playing lead guitar and rhythm guitar at the same time, he's also directing the band, giving them nods and winks as to where the hell to come in and whatever they’re supposed to be doing, and inspiring them with this magnificent guitar playing, and then throwing in all kinds of humor. You know it's incredible; it's really… just a fabulous performance. Watch Eddie Kramer present his Signature Series mixing tools and how he captured his legacy sound in the digital domain.